Facilities in bedrooms include en-suite bathrooms, private entrances, fridge/freezers, coffee and tea stations, hairdryers, air-conditioning and heaters. We also offer free wireless internet access on the premises. This wonderfully traditional farmhouse and most of the furniture have been lovingly restored to provide a cozy and comfortable country retreat for weary travelers. The owners made every effort to carefully decorate each room and camping unit uniquely. Bastion Farmyard also hosts Bastion Farm Stall & Coffee Shop with gifts, décor, and braai packs, wood, ice and it is fully licensed. Coffee, cake and tea are available during trading hours. Trading hours are also applicable for the shop. Guests, who book in after trading hours, will be assisted with buying basic supplies if possible. The shop will be closed on Saturday afternoons and Sundays. Bastion Farmyard is suitable for friends and family. Unfortunately we do not allow pets. Bastion Farmyard Camp Site offers you four spacious camping units. Each unit can accommodate 1 to 6 people and 1 vehicle with a trailer. At Bastion Camp Site each campsite offers you: En- suite bathroom with toilet, donkey heated shower, wash basin, own kitchenette with wash-up facility and food preparation area. Each camp site also has an electricity point, lights, washing line, luggage bench, enclosed barbeque with grid and a shaded paved veranda. Bastion Farmyard offers secure, spacious and safe off- street parking with fencing, control gates and a night guard for your peace of mind. No meals are served but, self-catering is possible to all in-house guests. Bastion Farm Kitchen is very well equipped with a stove, fridge/freezer, microwave oven, crockery, cutlery indoorbraai and braai equipment. Promoting a wholesome family lifestyle, you will find the only TV on the premises in Bastion Farm Kitchen, with a full DSTV bouquet. You’ll find us conveniently situated 1km from the B1 main road, 14km North West of Mariental and 9 kilometers from Hardap Dam. Covered verandas are ideal for outdoor entertaining. Braai is a great Namibian tradition and we provide both indoor and outdoor braai facilities. On arrival please use intercom system. 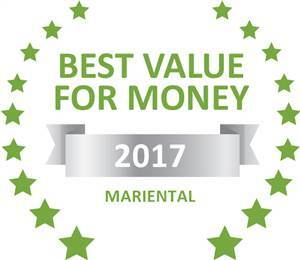 Based on reviews of establishments, Bastion Farmyard has been voted Best Value for Money in Mariental for 2017. Bastion Farmyard offers five very well- equipped en-suite rooms. Each room has its own private entrance and veranda to the spacious garden, which is ideal for children. Adjacent to the guesthouse are four en-suite camp sites. The guesthouse can accommodate up to 21 guests and 24 guests at the camp site. Bastion is owner managed with a generous scoop of personal hosting and a touch of special care for their guests. Guests are provided with old-fashioned quality and a wholesome family experience. We cater for happy locals and travelers; we’d love to do the same for you. Our facilities set us apart, and we know they'll make your stay with us even more enjoyable.